Carnegie Mellon University's School of Computer Science will dedicate the new Citadel Teaching Commons — a lab and study space that includes collaborative and high-performance clusters that will help learning and development of the next generation of computer scientists. Andrew Moore, dean of the School of Computer Science, will host the ribbon-cutting event in the Citadel Teaching Commons at 3:15 p.m., Jan. 27, along with Joseph Squeri, Citadel's chief information officer. The enhancements to the fifth floor of the Gates Center for Computer Science were made possible by a generous monetary and equipment donation by Citadel, a leading global financial institution with a diverse business platform built on a foundation of world-class leadership, talent and technology. "Citadel offers engineers and scientists the greatest challenges in high performance computing, machine learning, systems, software development and infrastructure," Squeri said. "From the moment you join Citadel, you are instantly an integral part of our team and are given the support and resources you will need to make an immediate impact. We are thrilled to partner with Carnegie Mellon because of its track record for innovation in these core areas, and we know that CMU students are exactly the caliber of people we need." The project includes two renovated computer labs featuring innovative desktops that can double as tabletop whiteboards. Desktops also have flat capacitive keyboards and inductive chargers. A cluster of 74 servers will support research and education in machine learning, distributed systems and parallel computing architecture. 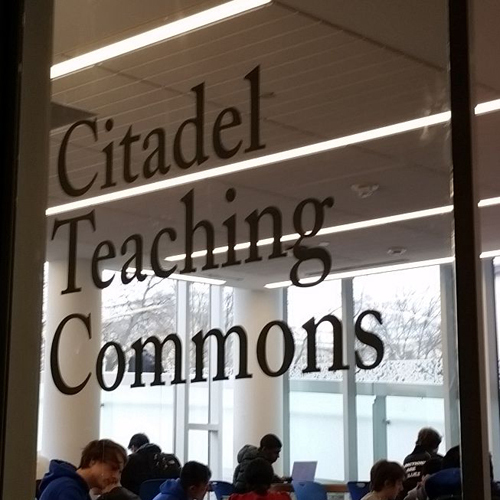 The Citadel Teaching Commons, has quickly become one of the most popular and highly used areas in the computer science building. The open area includes whiteboards and large, round tables that make it easier for students to meet in groups and with teaching advisers. "Computer science is not a solitary endeavor," said Greg Kesden, an associate teaching professor and director of educational computing. "Regardless of whether they are at established companies such as Citadel, or at startup firms, computer scientists typically work in teams to tackle projects. These new spaces, and particularly the teaching commons, will help us prepare students for this work environment." "Citadel's support for this project has been unwavering and gratifying," Moore said. "Citadel has hired a number of CMU graduates, particularly from computer science. The firm appreciates the vital coupling of computation with financial services and also the value of CMU alumni as leaders. This week, Citadel also sponsored a computational challenge for students, with $1,000 as the top prize. The School of Computer Science, which recently celebrated its 25th year as a school, has received the highest possible score in U.S. News & World Report's ranking of Ph.D. programs in computer science. A pioneering program in computer science since the mid-1950s, Carnegie Mellon has more than 1,800 undergraduate and graduate students and boasts 268 full- and part-time faculty members. SCS includes seven degree-granting departments: Computer Science, Robotics, Human-Computer Interaction, Machine Learning, Language Technologies, Software Research and Computational Biology. Follow the school on Twitter @SCSatCMU.